Our commitment to quality and our record for excellence means you can rest assured that your new roof will last for years to come. Welcome to the website of True Pro Quality Roofing, Inc. With over 25 years in the residential roofing industry, we are proud to service the Dallas, Fort Worth metroplex for many years. True Pro Quality Roofing, Inc. is a member of the Roofing Contractors Association of Texas and also proud members of the Better Business Bureau. When it comes to residential roofing, True Pro Quality Roofing, Inc. specializes in constructing, maintaining, and protecting your home's roof from eave to eave. Our expertise includes installation of ventilation, gutters, radiant barriers, and downspouts, for any style roof imaginable. If you can answer yes to any of the following questions you should consider having your roof assessed for repair or replacement. Has your hometown recently been victims of a severe storm that included hail or even wind? Do you have shingles that appear to be curled up? Curling shingles will allow opportunity for rain leaking into your home which results in further damage. Do you have shingle granules that are worn off or bruised from storm damage? Signs of granule damage include dark spots on the shingles or granules in your gutters and by your downspouts. Do have loose or missing shingles that will cause leaking? Cracked shingles will also cause leaking and further more expensive damage. Spots on your ceiling definitely indicate a leak problem that should be repaired as soon as possible. Do you have black or green algae streaks on your roof? These algae stains are ruining the beauty of your roof. How old is your roof? Depending on the quality, most shingles last 10-25 years. If your home is the same age as others in the neighborhood that are getting new roof replacement work, it may be time to replace yours too. The roof is one of the most crucial components of your home. Because you want your home to be protected and to look fantastic, the selection of materials is an important part of residential roofing. 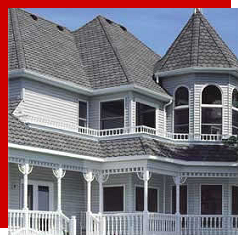 True Pro Quality Roofing, Inc. offers a variety of premium roofing materials by the very most well-known roofing product manufacturers in the residential roofing industry. These roofing products are available in a wide range of colors and styles and can be toured from our products page of this site. Roofing leaks can cause extreme damage to your home and disrupt your family's daily routine dramatically! So the best time to fix your roof leaks is before they happen! Here are some signs that you should you look for? Do your ceilings or walls show any discoloration from water leaks? Check your attic for water stains on the rafters or underside of the roof decking. In your dark attic, is any light visible? Look near that area for water stains. Over the last 5-10 years have your energy costs gradually increased? If there have been no JEA rate increases, this may indicate a roofing material or insulation breakdown. Inspect your roof surface. Are shingles missing, curling, or cracked? Is there significant granular loss? On a flat roof do you see areas of stain from ponded water? Is roofing material pulling away from the penetrations or from the walls? Blistered paint near attic walls or siding decay may indicate poor attic ventilation. Dark or dirty looking areas may come from fungus or vegetation growing on your roof. At worst, dips and buckles in your roof may indicate rotting in your decking or rafters. Whether we are repairing your roof or installing a new roof, for every roofing project, our insurance claims specialists at True Pro Quality Roofing, Inc. will provide you with a free quote after an expert on-site roofing evaluation has been provided. We will provide you with a solution that will meet your needs at a price that you can afford. Throughout the project, our residential roofing experts will complete your roofing project efficiently and with the utmost respect. We would like to invite you to tour the rest of our website. We hope you find information that will be helpful in deciding what your roofing needs may be. If you have any questions or we can assist you in any way, please contact True Pro Quality Roofing, Inc. at 972-491-1830. For your convenience, we have implemented a request services form on our website. We would also like to thank you for your interest in True Pro Quality Roofing, Inc., we look forward to hearing from you in the near future!